Yellowtail fish is one of the most popular menu choices at sushi restaurants. But how much do you know about this famous entree? For one thing, it’s not actually tuna, as many people think. Most of the time, yellowtail actually refers to Japanese amberjack, a delicious fish that lives between Japan and Hawaii. 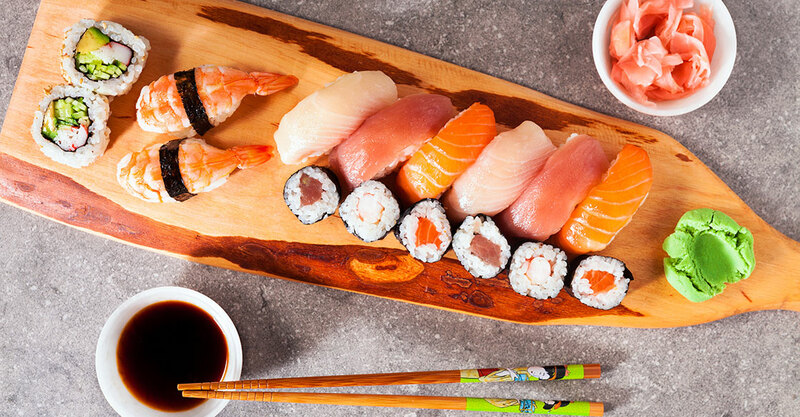 Let’s dive into everything you need to know about yellowtail fish so you can get to know how your favorite dish came to be a sushi restaurant staple. In the past, people typically ate yellowtail fish during winter. This is because they have a higher fat content during these months. In Japanese, the fish are referred to as hamachi or buri, depending on their weight. They are generally caught in the regions of Horukku and Toyama. Generally, each May, sea farmers gather fish eggs that are hiding under seaweed. They are then sold to aquaculturists, who will then raise them until they reach three kilograms (when they are called buri) or five kilograms (when they are called hamachi). Chefs prepare yellowtail fish in a variety of ways. In Korea, the fish is served raw and sliced into thin pieces. From here, you wrap the fish in either lettuce or fragrant sesame leaves, add a little garlic and chili paste, and then you wrap it all up. In Japan, chefs utilize a wide variety of preparations. Oftentimes, they prepare a delicious soup with lightly fried yellowtail fish. Of course, we’re most familiar with yellowtail sushi in sashimi. You generally have the option to enjoy it as nigiri or in a roll where it may be combined with a variety of vegetables like cucumber and avocado along with delicious sauces. When it comes to fish, fat is a good thing. Yellowtail fish is amazingly high in protein and is one of the best sources of omega-3 fatty acids. These are the healthy fats that are packed with a wide range of benefits, including reducing blood pressure, decreasing inflammation, and even improving mood. It’s also a great source of vitamins and minerals, including Vitamin B12, B6, and selenium. What’s the Best Way to Enjoy Yellowtail Fish? Well, that’s really up to you. Since there are so many different serving options out there, the sky’s the limit on how you want it prepared. Each fish has its own unique and delicious flavor. So, oftentimes, people choose to pair it with a selection of other fish, including salmon, tuna and mackerel. You’ll want to allow your palate to explore a wide range of different experiences to find which one you like best. Most people also enjoy pairing the fish with sake, beer, or green tea. To best enjoy the fish, take time to savor how the chef puts the flavors together. There’s no one way to eat sushi. Add soy sauce, wasabi, or even hot sauce if you like. The best thing you can do is ask the chef what they think is the best way to enjoy the fish. It changes for each one, depending on how it is prepared and personal preference. Yellowtail fish is a sushi classic for several reasons. It’s delicious, healthy, and can be prepared in a variety of ways. Come enjoy this great fish and even more of the amazing sushi and sashimi we offer at our San Diego locations.